Mary Carter married Benjamin Osgood in Dec 5, 1753. Dinah Carter and Mathew Knight declared their intentions of marriage on Jan 15, 1762 Leominster, Worcester Co., MA, USA. Dinah Carter married Mathew Knight in Mar 18, 1762. Samuel Carter married Charity Van Nostrand w/1. Samuel Carter married Mary Briggs w/2. Stanton Carter and Peninah Albert declared their intentions of marriage on Feb 5, 1762 Lancaster, Worcester Co., MA, USA. Stanton Carter married Peninah Albert, daughter of Daniel Albert and Abigail Houghton, in May 27, 1762 at Lancaster, Worcester Co., MA, USA. Silas Carter married Lucy Sawyer, daughter of Josiah Sawyer and Abigail Sawyer, in Jan 12, 1768 at Lancaster, Worcester Co., MA, USA. Silas Carter married Mary Ray in Jun 11, 1816. Prudence Carter married Ebenezer Carpenter in circa 1765. Jonas Carter married Rachel Wadsworth and had two children. Jemima Carter and David Nims Jr declared their intentions of marriage on Oct 1, 1767 Lancaster, Worcester Co., MA, USA. Jemima Carter married David Nims Jr in Jan 12, 1768 at Lancaster, Worcester Co., MA, USA, Nourse: p. 100 Mar;p. 40 Int. Marriage Feb 16, 1694 Lancaster, Worcester Co., MA, USA, No source appears to give correct md; internet date used. Lancaster VR , Keizer, JWH: Dec 16, 1704; C.A. Torrey:"b 1696 (m 1704 is wrong); Lancaster"; BT:"Probably, however, the year of their marriage 1704, in Miss Charlotte Whitcomb's "Whitcomb Family in America" is too late. It apparently rests on the data furnished the Lancaster town clerk in 1825 by Henry Houghton of Putney, Vt., which is erroneous. "; CJV: Houghton lineage document by Josiah Flagg, Lancaster MA town clerk, dated Jan. 20, 1826, gives date Dec.1 6, 1704; but it also gives Jacob as born in July 24 1680 based on Henry Houghton data which was erroneous. Rebecca Whitcomb married Jacob Houghton, son of Justice John Houghton Jr & Sr and Mary Farrar, in Feb 16, 1694 at Lancaster, Worcester Co., MA, USA, No source appears to give correct md; internet date used. David Nims Jr and Jemima Carter declared their intentions of marriage on Oct 1, 1767 Lancaster, Worcester Co., MA, USA. David Nims Jr married Jemima Carter, daughter of Samuel Carter Jr. and Jemimah Houghton, in Jan 12, 1768 at Lancaster, Worcester Co., MA, USA, Nourse: p. 100 Mar;p. 40 Int. Willard: Feb. 23, 1724-5, "in 1825 at the request of Henry Houghton of Putney VT, the Lancaster town clerk made another entry, stating marriage on Apr 30, 1730. The original was correct; date of 1730 would place legitimacy of son Abraham in question as he was born Nov. 27, 1725"
Willard: Feb. 23, 1724-5, "in 1825 at the request of Henry Houghton of Putney VT, the Lancaster town clerk made another entry, stating marriage on Apr 30, 1730. The original was correct; date of 1730 would place legitimacy of son Abraham in question as he was born Nov. 27, 1725." Birth 1700 Lancaster, Worcester Co., MA, USA, MLM: "second son," also called junior." Benjamin Houghton Jr married Ruth Wheelock in Jul 20, 1720 at Lancaster, Worcester Co., MA, USA, by Justice John Houghton; Burr & Gage: Worc. Deeds, lib. 43, p. 200. Problem There are problems with JWH's listing of children for this Israel Houghton. JWH gives 17 children, the first 3 clearly not his. 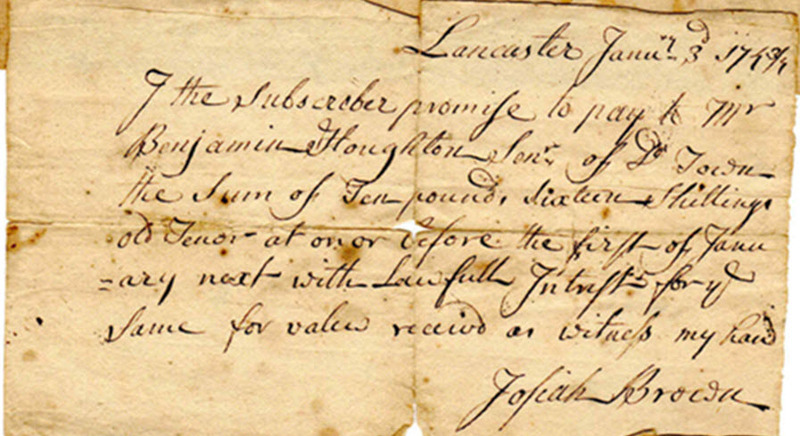 Lancaster VRs gives Deacon Israel as marrying Elizabeth Wilder in 1769; JWH gives Israel's son Israel as marrying her. Deacon Israel Houghton married Martha Wheelock in Jul 31, 1723 at Lancaster, Worcester Co., MA, USA, by J. Houghton; JWH, MLM: 7,21,1723. Deacon Israel Houghton and Elizabeth Wilder declared their intentions of marriage on Feb 18, 1766 Lancaster, Worcester Co., MA, USA; Den. Israel Houghton & Widw. Elizabeth Wilder, both of Lancaster; 1766 date is given in list of 1769 intentions [typo? for 1769]. Deacon Israel Houghton married Elizabeth Wilder in Mar 14, 1769 at Lancaster, Worcester Co., MA, USA, JWH: gives marriage of Israel, son of Israel and Martha Houghton, to Elizabeth Wilder, 2,18, 1766. Jonathan Houghton Jr married Mary Houghton in Jan 20, 1725 at Lancaster, Worcester Co., MA, USA, "Jonathan Houghton and Mary Houghton, both of Lancaster"by John Houghton, Just. Peace; both of Lancaster. Death Oct 23, 1769 Bolton, Worcester Co., MA, USA, John Houghton, Jr., a. 57, GS3; intestate; B.T., 1926: "John...known as John Houghton, Jr., died in 1769, aged 57." Problem The above John Houghton is consistently referred to as John Houghton Jr. in most of the vital records and all of the probate records. His son, who married Keziah Ross, is referred to as John Houghton 3rd. 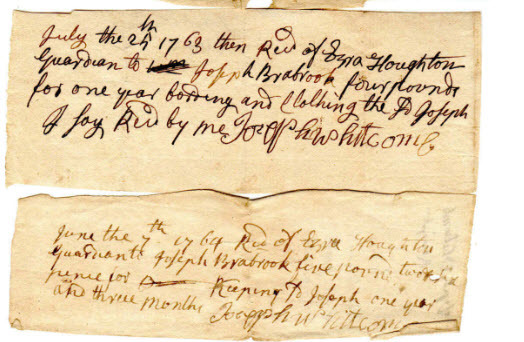 John Houghton married Hepzibah Priest, daughter of John Priest and Anna Houghton, in Nov 13, 1735 at Lancaster, Worcester Co., MA, USA, by J. Wilder; JWH: 1,13,1735. Ruth Wheelock married Benjamin Houghton Jr, son of Jacob Houghton and Rebecca Whitcomb, in Jul 20, 1720 at Lancaster, Worcester Co., MA, USA, by Justice John Houghton; Burr & Gage: Worc. Deeds, lib. 43, p. 200. Burial Chocksett Burial Ground, Lancaster, Worcester Co., MA, USA, "Death is a Debt to Nature due, | Which I have paid & so must you." Deacon Oliver Moor married Abigail Houghton, daughter of Jacob Houghton and Rebecca Whitcomb, in Dec 18, 1729 at Lancaster, Worcester Co., MA, USA, by Joseph Wilder. Abigail Houghton married Deacon Oliver Moor in Dec 18, 1729 at Lancaster, Worcester Co., MA, USA, by Joseph Wilder. Elizabeth Rand married Henry Houghton Jr, son of Henry Houghton and Abigail Barron, in Nov 24, 1725 at Lancaster, Worcester Co., MA, USA, by J. Houghton. Notable Ezra Houghton (1722-1789) was a Tory loyalist in the American Revolutionary War. There were only 4 Houghtons (John Houghton 3d, Solomon Houghton, Nahum Houghton, and Ezra) to stay loyal to England. All had lands confiscated. Ezra Houghton and Dinah Houghton declared their intentions of marriage on Mar 6, 1747/48 Lancaster, Worcester Co., MA, USA. Ezra Houghton married Dinah Houghton, daughter of Benjamin Houghton Sr and Zeruiah Moore, in Jun 23, 1748 at Lancaster, Worcester Co., MA, USA, JWH: 7, 29, 1748. Trumpeter Abijah Houghton Sr and Alice Joslin declared their intentions of marriage on Mar, 1746 Lancaster, Worcester Co., MA, USA; DAR: Bolton. Relief Houghton and John Fairbank declared their intentions of marriage on May 8, 1751 Lancaster, Worcester Co., MA, USA. Relief Houghton married John Fairbank in Jul 10, 1751 at Lancaster, Worcester Co., MA, USA. Capt. Elijah Houghton and Katharine Sparhawk declared their intentions of marriage on May 31, 1760 Lancaster, Worcester Co., MA, USA. Capt. Elijah Houghton married Katharine Sparhawk in Nov 27, 1760 at Cambridge, Middlesex Co., MA, USA. Marriage banns for Capt. Elijah Houghton and Mary Allen were published on Sep 14, 1764 at Lancaster, Worcester Co., MA, USA. Capt. Elijah Houghton married Mary Allen in Oct 3, 1764 at Lancaster, Worcester Co., MA, USA. Parnee Houghton and John Brooks declared their intentions of marriage on Sep 9, 1748 Lancaster, Worcester Co., MA, USA. Parnee Houghton married John Brooks in Oct 20, 1748 at Lancaster, Worcester Co., MA, USA, by J. Mellen. Philemon Houghton and Rebecca Gates declared their intentions of marriage on Dec 4, 1757 Lancaster, Worcester Co., MA, USA. Philemon Houghton married Rebecca Gates in Feb 23, 1758 at Lancaster, Worcester Co., MA, USA. Nahum Houghton married Sarah Hazleton in Jan 20, 1777 at Concord, Merrimack Co., NH, USA. Ruth Houghton and Jonathan Fairbank Jr declared their intentions of marriage on Jan 11, 1755 Lancaster, Worcester Co., MA, USA; both of Lancaster. Ruth Houghton married Jonathan Fairbank Jr in Feb 3, 1755 at Lancaster, Worcester Co., MA, USA. 1790 Census 1790 Canajoharie, Montgomery Co., NY, USA, Lemuel Hoten: 2 males 16+; 2 males under 16; 3 females. B. Meritt: "But this was before the formation of Otsego County and Worcester Township, and the association of names before and after lemuel Hoten in the census of 1790 shows that in fact he was living in Worcester in that year, whither, as we believe, he had come directly from Westminister in Massachusetts during the preceding year. His family consisted of himself, a son of 16 years or older, two sons under 16, his wife, and two daughters. As the family reveals itself in successive census records it appears that the older boy was born probably more than a scant 16 years before 1790 and that he cannot have been Elijah5, because Elijah5 was already married and had children before 1790."..." We tentatively suggest that the older boy in Lemuel's family in Worcester in 1790 was born about 1771. The two girls were Dinah5 and Olive5 (bis); one of the younger sons was Lemuel5, and the other younger boy was probably Luke5 Houghton, who appears separately in the census of 1800..."
Death between 1810 and 1811 Worcester, Otsego Co., NY, USA, Wife a widow in 1812. Lemuel Houghton and Dinah Osgood declared their intentions of marriage on Apr 20, 1758 Lancaster, Worcester Co., MA, USA. Lemuel Houghton married Dinah Osgood in May 1, 1758 at Lancaster, Worcester Co., MA, USA. Elisabeth Houghton and William Brown declared their intentions of marriage on Aug 14, 1763 Lancaster, Worcester Co., MA, USA. Elisabeth Houghton married William Brown in Oct 20, 1763 at Lancaster, Worcester Co., MA, USA.